The origin of the name is uncertain. The Latin name for the plant, juniperus, may derive from an earlier Celtic term; it may also derive from the Latin iuveniparus, "early bearing." The species name communis is Latin for "common." Native to Europe, North America, and northern Asia, juniper is an evergreen shrub growing 1 to 12 feet tall. It is densely branched with needle-like foliage jointed at the base. Scales of the female fruiting cones become fleshy and form a berry. The berries are green when young and become blue-black in eight to ten months. This shrub smells much like pine, with citrusy overtones. It prefers full sun and well-drained soil and can tolerate extremely cold weather. Juniper berry stimulates the flow of urine by increasing the glomerular filtration rate, the process by which blood and wastes are purified. A small amount of the berries (five to seven) eaten before a meal helps stimulate hydrochloric acid production; eaten every day, they help clean out residues of tar and nicotine in the lungs for smokers who are quitting that habit. Juniper berry is used in the treatment of appetite loss, arthritis, catarrh, cholera, cystitis, diabetes, dysentery, flatulence, flu, gonorrhea, gout, kidney stones, tapeworm typhoid, and urinary tract infection. Topically, juniper can be added to massage oil or used as bath herb in the treatment of joint and muscle soreness, rheumatism, and cellulite; it also can be added to salves to treat acne, eczema, or psoriasis or, as a chest rub, congestion. Juniper berry tea can be used as a gargle to relieve sore throat, as a hair rinse to treat dandruff or alopecia, as a douche to treat yeast infection, or as a room spray or steam inhalation to treat lung infection. The berries are edible; they are ripe when blue. They are sometimes roasted and used as a coffee substitute; they also can be dried and ground and used as a spice, much like pepper. Along with the branches, the berries are also used to flavor gin, chartreuse, and other alcoholic beverages. 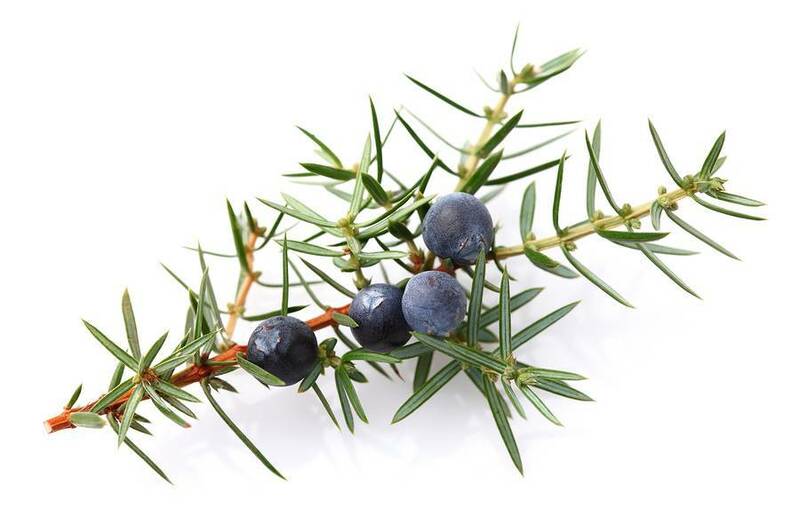 Juniper tea was once used to disinfect surgeons' tools. As an incense, juniper has been burned for its purifying properties, at times during epidemics. The essential oil repels insects and is included in some perfumes. In European and Native American folkloric traditions, juniper is said to offer protection against theft, accidents, wild animal attacks, sickness, and evil. Avoid during pregnancy or in cases of heavy menstrual bleeding. Long-term use may irritate the kidneys.